Our Lunchtime Supervisors care for the children during the lunch break. There are no teachers on duty with the exception of the Head Teacher/Assistant Headteachers. 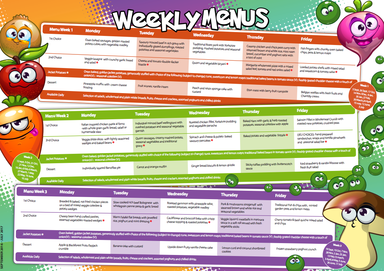 The school cook and her staff prepare a hot, nutritionally balanced, healthy meal daily and menus are displayed so pupils know in advance what is being served each day. We encourage the pupils to stay for school lunch as this is a sociable, relaxed time when good manners and healthy eating can be encouraged. We have worked with the children to devise a menu that they enjoy as well as in keeping within Government guidelines. If you feel your child may be entitled to free school meals you can obtain further information from Gateshead Civic Centre. Meals can be paid for weekly or monthly by cheque (made payable to Gateshead Council) or by cash. Dinner money should be sent to school on a Monday morning in a school meals service envelope available from the school office. School meals must be paid for in advance and change is not given but will be credited to your child’s account and carried over for future use. Children are welcome to stay at school for packed lunch if they choose or go home. We request that Reception children staying on the premises have a school lunch to begin with as we are able to arrange for them to be served their lunch a little earlier and the staff assist them in a quiet, calm atmosphere. Taster lunches for the Reception children are arranged during the induction period and parents are invited to attend if they wish. Packed lunches should be sent in a suitable container, clearly marked with your child’s name and may include a carton of juice. Sweets and fizzy drinks are not consumed on the premises during the school day. In keeping with our Healthy School status we request that parents provide their children with a healthy packed lunch that is well balanced and follows Government guidelines on fat, sugar and salt content. The school is very conscious of encouraging healthy eating and to this extent we only allow fruit to be consumed as a snack at playtimes. KS1 pupils receive a piece of fruit daily free of charge. KS2 pupils are encouraged to bring their own fruit to school daily.